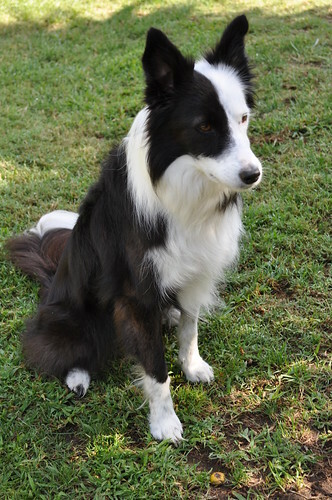 Vegas or Vegie is a rescue split faced border collie who is a flyball fanatic. She and her mom Joanne, have been racing in flyball for seven years and hold numerous titles. Vegie loves flyball more that anything else in the world. She usually is in the start dog position and smiling as she clears the jumps. She enjoys walks, playing frisbee and likes to ride in the car. She recently took up swimming which she enjoys immensely. Vegie has great flyball skills and is the border collie on our team logo. I hope she gets residuals on team merchandise! Can you believe she stayed sit so we could take a picture? She has been asking for a increase in her allowance though. Your girl has lots of extracurricular activities! She is very pretty!